Acknowledgements to a PhD dissertation rarely find their way into the open. Hidden in plain sight at the front of the volume that represents four years of my life resides a chapter that was incredibly difficult to write, but will probably be skipped by most readers interested in the science. How do you thank everyone, in just 3 pages? And how do you thank the people who, for four years, have been there at the sideline, but will never get to see the paper version of the book? There’s an obvious solution: to bring it out into the open. To blog it. Not in its final form, though. There will be some modifications here. But also some additions which will not make it into the final volume. Writing an online version of the acknowledgments allows me to add a paragraph for you, dear online reader, Twitter follower or Facebook friend. Because you were part of this too. A wise man once said that a PhD is a lonely business. A task which, much like quests in Arthurian tales or in fairy tales, has to be performed alone to prove one’s worth. To slay a dragon, save the damsel, and publish five papers about it. A task which, once completed, opens the castle gates and wins eternal grants and glory. But that’s not entirely accurate..
A PhD, dear readers, is a Wagner opera. Sometimes tedious, sometimes eventful, but above all a long and exciting journey past trolls, through caverns, swamps and mythical lands to find enchanted rings and swords. But like in any quest, the hero of the PhD drama does not have to be alone. A team of people and institutions has accompanied me throughout my travels through science. This chapter, this prelude to the Ride of Valkyries that follows, is for them. Above all I wish to thank my supervisors Nele and Ann. I could not have wished for two better supervisors than my own. For four years, they have followed me, kept up with all the sudden plot twists, developments and changes to the libretto. Their experience and advice has been of most precious value to me. While other projects and quests crossed their path, they have always taken their time to steer me back onto the right path of research. With all my heart, thank you. I’d like to thank Nathalie, Jaco, Hildegarde and Hans for their counselling and input into my work throughout these four years. In this respect, I also wish to thank the members of the jury for their critical evaluation and comments which have made this thesis a stronger and more robust work of science. Furthermore, such a long and perilous journey could not have been completed without the financial, administrative support of the Research Foundation Flanders (FWO), the Belgian Nuclear Research Centre (SCK●CEN) and the University of Hasselt. Every good opera has a strong supporting cast to accompany the dramatic moments. To share in the joy of successful experiments, to peer for hours and hours over small eppendorf tubes to place miniscule Arabidopsis seeds on agar (why oh why didn’t I choose beans as a model plant?). To freeze thousands of little seedlings to an icy death. To spend hours in darkened rooms to watch amputated leaves photosynthesise. To provide coffee, chocolate, cake and support. My most profound thanks to all the people (past and present) of the Biosphere Impact Studies Unit. Thank you for these four wonderful years of my life. You have been like family. There has to be a special mention for my train colleagues here. Sharing two hours each day in a confined space on wheels creates a bond. Especially when that space is usually late or subject to the mysteries of railway operations. Their good humour has on many occasions saved my mood of the day to come. Between the days of eppendorf labelling and failed PCR’s, there were always the moments of relaxation and comfort among friends. Some had their own quest, and exchanged hints on how to tackle the dragons and save the treasure. Some did not have a clue what I was raving on about (Plants? Mutants? ), but nodded quietly and smiled. Some were lost along the way and some arrived late on the scene. But all were part of this thesis. All contributed in their way to make this voyage through research bearable, by giving their advice, their support, their friendship and their love. This is as much your work as mine. A tous mes amis français qui m’ont suivi lors de mon voyage scientifique… à tous mes amis périgourdins qui m’accompagnent depuis tout ce temps (certains depuis plus de 20 ans)…cette thèse est la votre aussi. Une grande partie de cet ouvrage a été écrit dans mon pays d’adoption, cette terre d’accueil qui s’appelle le Périgord. A travers ces pages vous verrez, je l’espère, le canard, les noix et le Monbazillac qui ont accompagné ces moments d’écriture et les promenades dans la Bessède, peut-être même les moments de repos au bord de la Dordogne. Ecoutez, les gascons, c’est la Gascogne ! And finally, but most importantly, I could not have done any of this this without my family. Without both the moral and financial support my parents have given me throughout all these years of study and research. Without the support only a brother and sisters can give to their ‘little brother’. And perhaps most of all, this PhD thesis is my parents’. I could not have done this without the assurance and advice of my father. Without my mother, who sadly cannot be here today to see the result of all the support and love she has given me. I hope I would have made her proud. For you, dear reader, who is about to relive this journey, this four year quest, through my eyes. Don’t let the technicalities of the libretto, the formulas and the strange world of radiation discourage you. 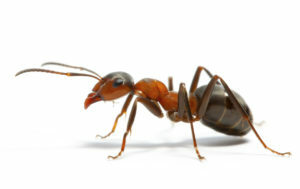 The Vinegar and the Ants, or: How did I become a biologist? My last post on science and academia , which explained why finding a job outside academia is not such a bad thing, stirred up quite a few questions among friends, colleagues and readers. Some people continued to disagree. Some had good arguments for that. Some did not, and disagreed simply because a little voice in the back of their head told them to disagree. Overall though, the replies and encouragements told me I had hit upon a subject which, though very much alive, is still a bit of a difficult topic around the academic coffee- and cafeteria tables. But gradually, the debate became a bit more philosophical. After all, it’s all very well to say that being a scientist has something to do with the way you think, the way in which you solve a problem and see the world. But where does it start? When do you become a scientist? And, more specifically, how do you become a biologist? Now, as always, there are people who have asked these questions before. One of these questions has been answered quite brilliantly by my Twitter contact Anne Osterrieder (or @AnneOsterrieder , if you like). Her excellent story in drawings which describes her journey through science is a very good illustration (mind the pun) of the bumpy, long and winding road most people follow in their travels through science and research. My own story follows similar roads. But I am not as good a communicator as Anne, and I cannot hope to match her drawing skills.. so I will try to do it in words only. Well… almost. My earliest contact with (what you could consider) science are the ants behind our rented holiday house in the South of France. And a bottle of vinegar. Now, before you start calling the Ethics in Animal Testing commission, let me explain. I was six years old. No, that’s not an excuse. But still. Hold on. It’s not as bad as it sounds. There was a nice trail of ants all the way across the stone stairs behind the house, leading from their colony to whatever food source they were interested in. I never found out what it was, of course. Mainly because I quickly got distracted and lost track of whichever ant I was following. After all, their tendency not to go to their destination in a straight line is really quite annoying. But we digress. Then, for some reason, I started playing God. What would happen, I wondered, if you pluck an ant out of its trail and put it down a few inches to the left? Would it have a kind of Flatland experience, being pulled out of its world and transported to another part within seconds? Of course, this was much too tempting to resist. And so it began. Dozens of ants did not find their way home that night. I then discovered I could divert them to a different food source. If you soak a sugar cube in water and place it not far from their trail, eventually a stray ant will bump into it and then something magical happens. The lucky individual starts running around in circles as if it has hit the jackpot (in a way, it has), until it bumps into a colleague. What follows is a thing that, until this day, still marks me as a defining moment: they communicate. You can see them exchange information. Now, I know it is easy to anthropomorphise such things, but you could *see* them exchange the information. And I knew. Because, instead of going on to whatever it was going to, the second ant went straight for the sugar. Obviously, I did not decide there and then that I would become a biologist. Let alone an entomologist. Or an ant-ologist (I prefer that to ‘Myrmecologist’). But it did place the living world into a new context for me. It had suddenly become a lot more interesting. So, when 12 years later I was sitting in that lecture hall in Antwerp for my first lesson of Zoology, I was looking forward to it with a certain feeling of excitement. Now, I know we’ve gone a bit fast-forward here. But really, for 12 years, not much had happened. At least not on the ant-front. Somewhere along the road I must have become a scientist, at least in thought, because I had nicely followed the path to exact sciences during my entire school career and here I was in the 1st year of BSc. Biology. Had I been drawn towards science? I don’t know. So there you have it. The great reveal. I really don’t know exactly when I became a scientist. All I know is that I started to enjoy (and still enjoy) every bit of science I could read hear about. At some point the Milky Way in the sky became not only a pretty sight, but the delayed light of millions and millions of stars. At some point, the seemingly quiet world became a fascinating place where living things cover every inch of surface and most of our living space (yes, even those exploding face mites are fascinating). Scientific knowledge has, aside from its role in increasing the understanding of our world, another very important function for me: it adds a layer of fascination and detail to the world. Like an Instagram filter, only slightly less hipster. It makes things much more interesting than they seem. And once you understand how science works, how it builds new knowledge out of previous facts, how it advances by question, falsification and answer, there must come a point where your mind tells you to release your inner explorer. And then you become an academic. Just kidding, of course. Really. I realise I haven’t told you about the vinegar. Or the lemons. Or the explosions.